Used extensively in line haul applications, what really makes this Pallet Cage / Big Box unique is not just its space saving in warehouse & during transport but its role in OHS. The Big Box was designed and can be used for a number of different applications. 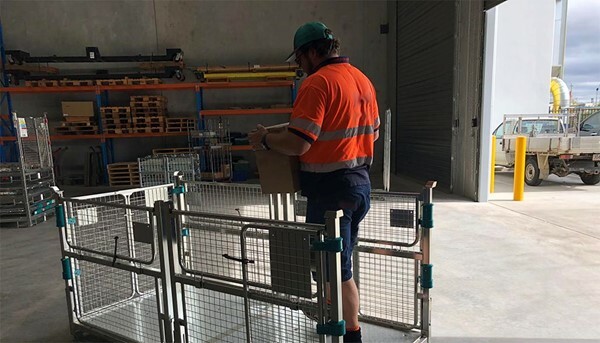 Used extensively in line haul applications throughout Europe and now Australia, what really makes this Pallet Cage / Big Box unique is not just its space saving in warehouse & during transport but its role in OHS. Occupational Health & Safety plays an important role in any workforce and preventing lost time injuries is always something you want to prevent. How does it improve on Safety? By having easy access Barn Doors on either end of the unit, it allows the worker to walk in walk out from both ends for loading & unloading. As they bend with their knees, rather than bending with their back as they would OVER the split side gates, it makes it perfect from a risk reduction point of view. In fact the Big Box has many different loading & unloading configurations. Not just side gates that swing open, but front gates also fold down allowing you to continue loading as the unit gets more full with product. It's construction also offers double stacking and optimised vehicle fill and folds down when not in use for easy storage or return logistics. The stackability of the pallet cage enables better cubic efficiency in warehousing, storage and in transport. It's designed to fit well onto forklifts, making for easy loading and unloading.